New York is far away so why not stay in tonight and order a pizza from Big Apple Pizzeria. Get the taste of New York Pizza right at home by ordering from Big Apple Pizzeria tonight. When you are looking for the best Pizza Salt Lake City Utah has to offer than Big Apple Pizzeria is the right choice. We have so many options including custom pizza, pasta, and calzones you won’t know where to start. Try one of our custom pizzas or design your own, the possibilities are endless. At Big Apple Pizzeria we want to make sure you have the best experience possible. We have a very mellow atmosphere at our Millcreek location so come in today and enjoy a cold beer and a slice of our New York style pizza. Why go to New York to have amazing Pizza when all you have to do is try the best pizza Salt Lake City Utah has to offer. Check out or amazing specials and get your family together for a night of fun at Big Apple Pizzeria. 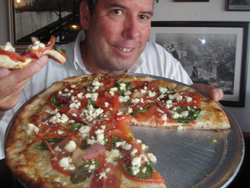 Big Apple Pizzeria has the best pizza Salt Lake City has to offer and we are only a call away. Come in today and try our lunch special. For only $4.95 you receive a slice of pizza, a cheese slice, salad, and a drink. We have many other specials for $4.95 that are available all day long so come in today to enjoy some amazing pizza and have some amazing company while you enjoy it.